Assistants help attorneys with tasks such as research, questioning witnesses and writing reports. Stand from which a witness gives testimony or serves as an expert witness under oath. Witnesses and the public sit at the back of the courtroom; priority is given to family members of the accused and the victim. 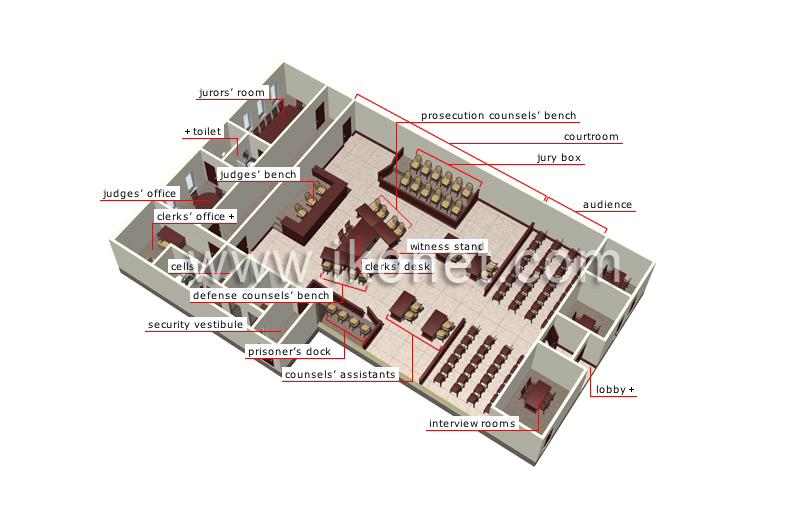 Rooms in which attorneys consult with their clients. Area of the court reserved for the main players in a trial, including the judge, jury, accused and attorneys. Premises designed to satisfy basic functions and equipped with toilets and sinks. Rooms where the accused are held while awaiting their court appearance. Duties of clerks include assisting judges, drawing up charges, informing judges of specific points of procedure and collecting evidence. Corridor that leads directly from the cells to the prisoner’s dock. Office used by judges to meet with assistants and attorneys and to prepare judgments. Room in which jurors deliberate; jurors are citizens selected at random, usually from voters’ lists. Judges preside over trials and ensure that proceedings are in accordance with the law; at the conclusion of a trial, the judge delivers a verdict and a sentence if the verdict is guilty. Table where clerks sit to record the proceedings. Box reserved for the jury, who deliver a verdict of guilty or not guilty at the conclusion of a trial. Prosecuting attorneys ensure that laws are enforced on behalf of society; they attempt to prove that the accused is guilty. Defense attorneys advise and represent the accused and attempt to prove the person’s innocence. Box in which the person alleged to have committed a crime remains during the trial.